Police have arrested a 74-year-old AFC Wimbledon fan after he was caught on camera throwing a banana at referee Graham Scott during Thursday night’s 2-2 draw with Port Vale. Though Scott was visibly amused after realising he’d been struck by the airborne banana, the pensioner was corralled before leaving the ground, then later interviewed by the police and released on bail. Police have also thankfully confirmed that they don’t believe the white-on-white fruit fight was racially motivated. “We saw the banana thrown on to the pitch and then reviewed television coverage. 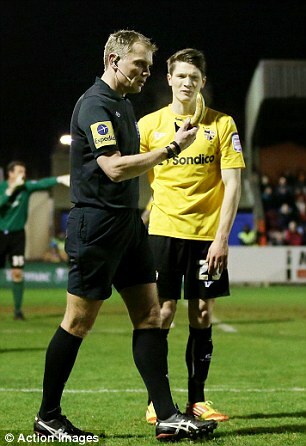 It appears a supporter was angered by a decision by the referee and aimed a banana at him. So the old boy took umbrage and pelted the referee with whatever he had to hand. Good job he wasn’t halfway through a scalding Bovril. Wow, what a world. Jailed for throwing a piece of food… I wonder how many of the kids in the juvenile jails are in for the same thing? Amazing. It’s a shame that the banana – sweet, starch, easy to carry and eat and once described on an American television program as “as close to not a fruit as a fruit can be” – has become so associated with racist morons that it is necessary to assure that a white pensioner who threw a banana at a white referee was not indulging in racism. What a very strange world our sport sometimes inhabits.